Flowers: growing loosely in axillary, slender racemes. Corolla: wheel-shaped, of four lobes. Calyx: four-parted. Stamens: two. Pistil: one. Leaves: on petioles; opposite; oblong or lanceolate; serrated. Stem: smooth; slightly curving and branched. 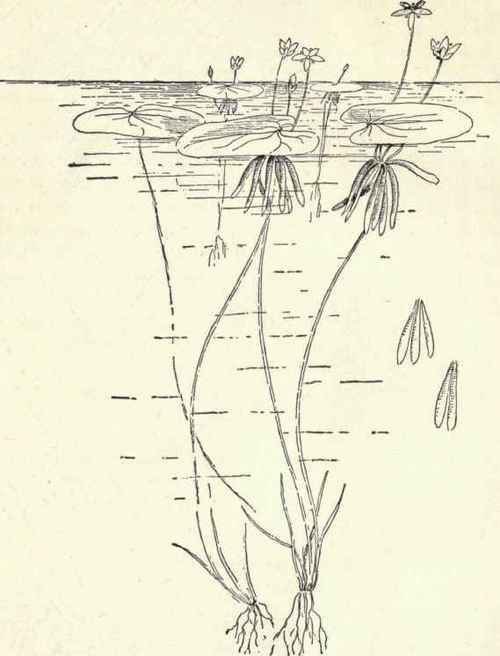 It is mostly in brooks and watery ditches that we find this dear little plant. Children often mistake it for the wild forget-me-not and are invariably disappointed when they learn that it bears no more tender name than American brooklime. Plants Growing In Mud: Bogs, Swamps and Marshes. Over in the swamps life is gay and free; for why should they be dull when they may be merry, or why should they throw out sparingly their bloom when their soil tells them to send it out abundantly ? In its time and place each lovely flower unfolds; the turtle travels slowly back from the nearest pond; the blackbirds pipe and the oriole matches the tint of his wing with the petals of the marigold. Grave willows have a fatherly care of the sweet community, and, although King Carnival pass up and down, disorder never reigns.